The months of September, October and November have it all; From late night dandiya parties to early morning puja's, these three months are generally described as the months that ‘India celebrates'. From tempting social invitations to enticing offers in the market, this period simply puts every Indian in ‘holiday mode'. 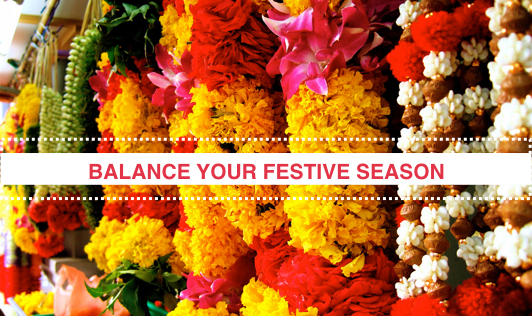 Although India's passion for festivals is world famous, our infamous commitment to work seems to be superseding the simple joys that this season brings. And to make things even harder, like bicycles in a stand, the fun just doesn't stop! As Indians, we do not enjoy certain freedoms that several of our western counterparts enjoy. Elsewhere in the world people recognize certain parts of the year as ‘holiday periods', and true to their word, they keep these parts strictly for ‘holiday'. They just don't work! - Most industries come to a halt, offices are closed and schools are on vacation. This allows for complete reformation, giving families the time they need together, while giving working professionals a refreshing break. • There's no such thing as a three month holiday! - Clearly define periods when you think you can celebrate, and make sure your deadlines don't hamper these dates. • Decide with your family before hand on what they'd like to do this festival season. • Try and meet your deadlines well in advance. • If meeting deadlines in advance isn't feasible, try and finish the laborious work first. Simply put, save the easiest for the last. • If you can't, then arrange your work around your holidays, not your holidays around your work. If you do the latter, then you will find that you never have sufficient space in your calendar to take any holidays. Once the above system is successfully in place, it is time to enjoy some quality time with family and friends! Great holiday packages, fabulous weekend getaways, health spas and an enormous amount of entertainment options are available. If you're not a family person, taking some time out individually to de-stress and revitalize is a welcome thought. But with all things beautiful, there always is a catch! The budget conscious among us might want to keep an eye on how much they can actually fork-out on the festival season. Shopping, eating out, gifts and entertainment can be heavy on the pocket. The health conscious among us might want to keep a tab on the mithai-intake! Going back to work with clothes that are a wee bit tighter isn't exactly the ideal post-holiday scenario. The tricky part of the festival season undoubtedly, is getting back to work. The festival season should only stop your train coaches at pleasant locations, and not de-rail them. Keeping your train on track is a somewhat awkward proposition, (in view of the bliss one might encounter during the festival season) but one that is most essential in deciding how effective your celebration really was. A balanced festival celebration will allow you to slip into, and out of ‘work mode' most comfortably, while providing you the refreshing break you'll need to double your productivity on your return.